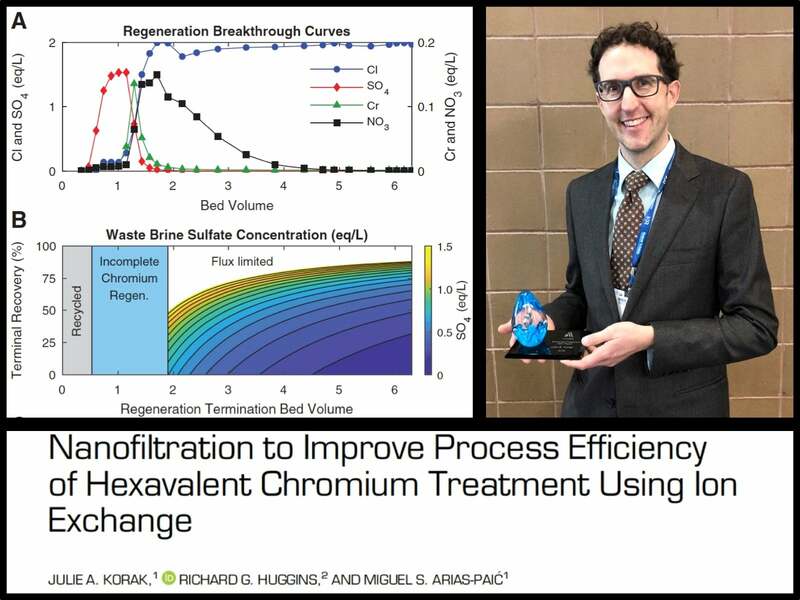 Assistant Professor Julie Korak was awarded the 2018 Membrane Treatment Best Paper Award from the American Water Works Association (AWWA) for her paper Nanofiltration to Improve Process Efficiency of Hexavalent Chromium Treatment Using Ion Exchange. Korak researched methods to concentrate the brine generated from water treatment and reduce the costs using a process called nanofiltration. The AWWA recognized her paper as an important achievement in the research being done in membrane water filtration. Water managers are concerned with the levels of a contaminant known as hexavalent chromium in drinking water sources. It is usually removed using a separation process that produces large amounts of brine. While it is necessary to remove contaminants, the brine presents economic and environmental difficulties in its disposal. Korak researched whether nanofiltration could be utilized to allow reuse of the brine, increasing the efficiency of water treatment. The nanofiltration membrane has tiny pores which will reject large ions while allowing smaller ions to pass through. Korak tested these membranes to understand their effectiveness and practicality for brine reuse. Korak tested waste brines from three California water treatment sites. She ran the brines through nanofiltration membranes and recorded which ions were successfully removed and the filtration rate. She then used her collected data to determine the feasibility of nanofiltration for a general process. Korak determined that nanofiltration was effective and could soon play an important role in waste brine management. It reduces waste volumes, recovers chemicals, and increases treatment efficiency. Additionally, it offers practicality in that it would be effective even in a small, mobile treatment unit. Co-authors: Miguel Arias-Paic (CU EVEN graduate, Bureau of Reclamation, US Department of the Interior, Denver) and Richard Huggins (Water Resources Group, SGM, Glenwood Springs).